That was recorded in 1951 but wouldn’t be released until the following year, as the B side to Red Saunder’s one and only radio hit. 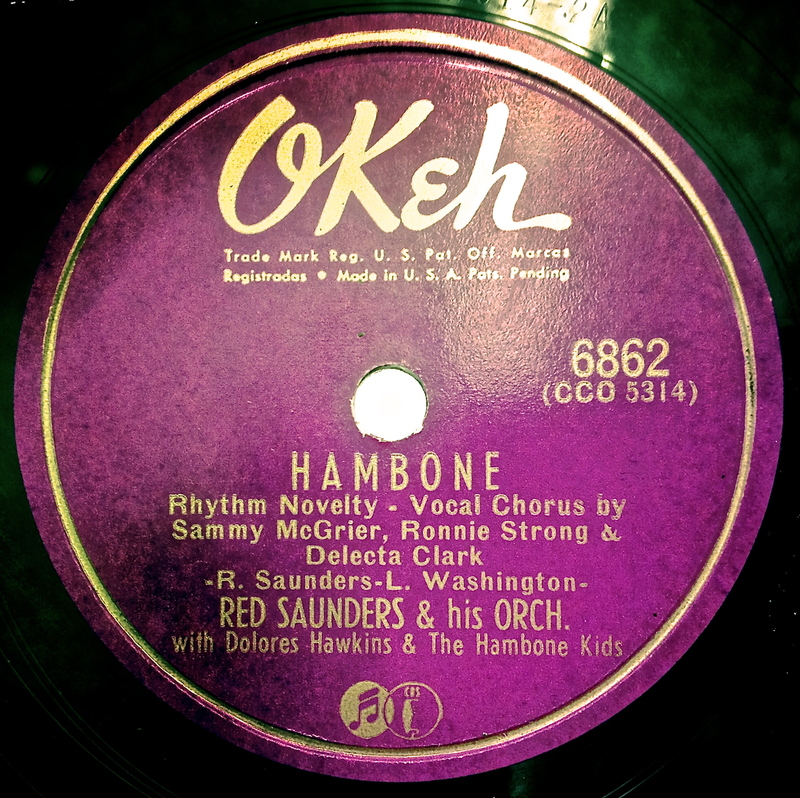 “Hambone” was a collaboration between Red and three Chicago teens—Sammy McGrier, Ronnie Strong, and Delecta Clark; that last singer would later go on to some success as Dee Clark. The “Hambone Kids” performed a kind of percussive dance called the Hambone (or “dancing juba”) that involved rhythmic slapping of the chest, thighs and feet. It was a novelty song, to be sure, but one rooted in a Haitian tradition that went back to the 19th century, popularized by southern kids whose parents had moved them up north to Chicago. This was not the creation of a Brill Building songwriter trying to capitalize on a passing fad. From the Red Saunders Discography. Of course that did not mean that other record companies couldn’t try their own versions of the song and cash in that way, especially since the song was #20 on the R&B charts and had sold 80,000 copies. Frankie Laine and Jo Stafford did a manic but soulless version that also sold well. So naturally, Okeh (and parent company Columbia) was eager to get the Hambone Kids back in the studio. The next single, “Zeke’l Zeke’l” was a lot of fun, but unfortunately failed to chart. 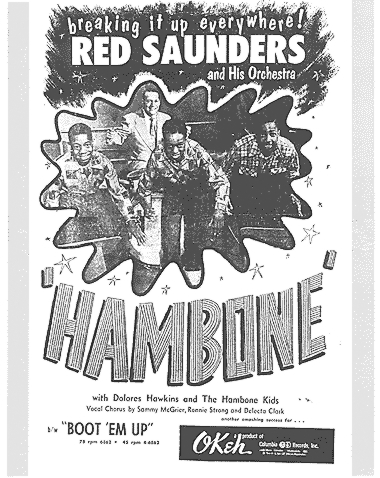 Columbia re-issued the Saunders version of “Hambone” in 1963 after it had been used as the theme song for a kid’s show, though it was an alternate take that added Dolores Hawkins doing some incredible “YEEEEAAAAHHHH”s (she just whistled on the original take) but subtracted the horn section. See what you think. And here he is backing Gospel dynamo Sister Rosetta Tharpe. As he often would, Red is playing with brushes, but sometimes the beat is so strong you’d swear he was using sticks. Red Saunders would continue to record throughout the 1960’s, albeit sporadically. His band had a long run at Chicago’s Regal theater, and Red continued to sit in with the likes of Duke Ellington and Louis Armstrong whenever they needed a substitute drummer. He died in 1981.